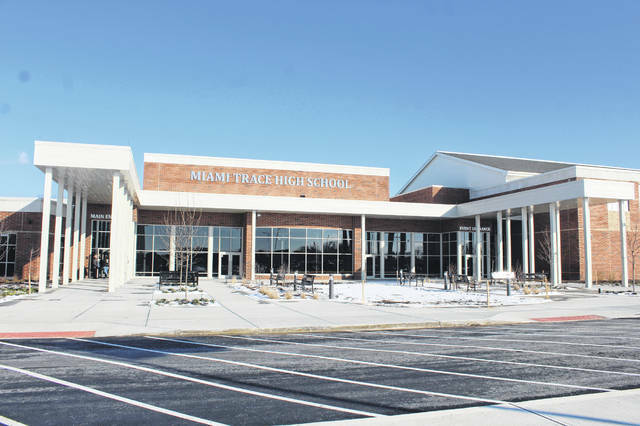 Miami Trace Local Schools held a Dedication Ceremony on Sunday for the new Miami Trace High School with various guests in attendance. The Miami Trace Jazz Band performed the Alma Mater and the fight song during the ceremony. Miami Trace Business Manager Bill Franke spoke about the project Sunday. Franke was the project manager on behalf of the district and worked closely with many groups involved in the creation of the school. 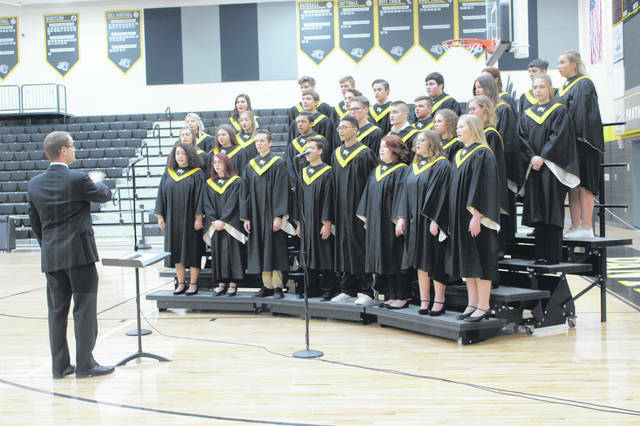 The Miami Trace High School Soundsations also performed during the ceremony. 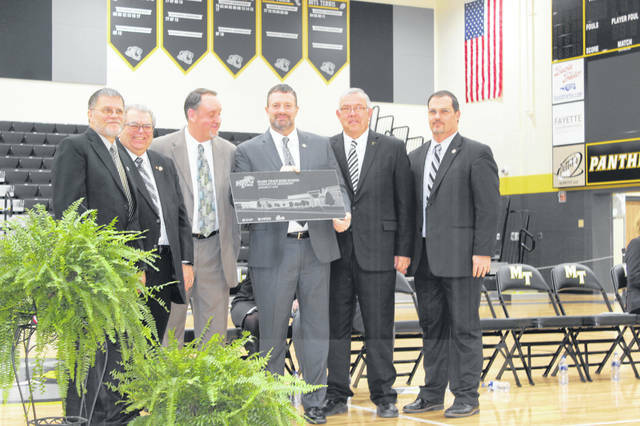 Project Manager, SHP Leading Design Josh Predovich (third from left), presented an etched plaque to the Miami Trace Board of Education and Miami Trace Superintendent David Lewis during the dedication Sunday. 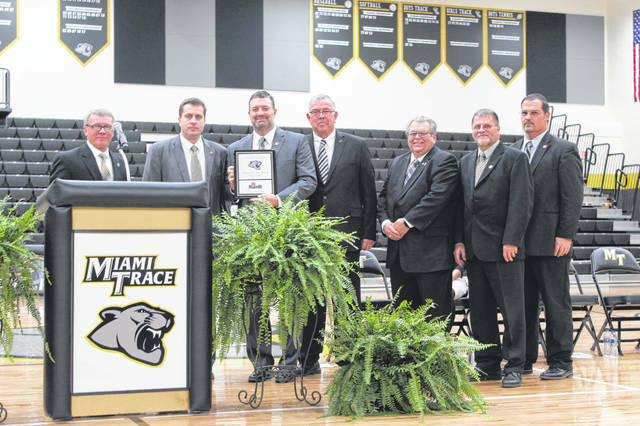 Project manager with Ruscilli Construction Company Inc., (second from left) Bill Mullett, also presented a plaque to Miami Trace High School Principal Rob Enochs, Miami Trace Superintendent David Lewis, and the Miami Trace Board of Education on Sunday. 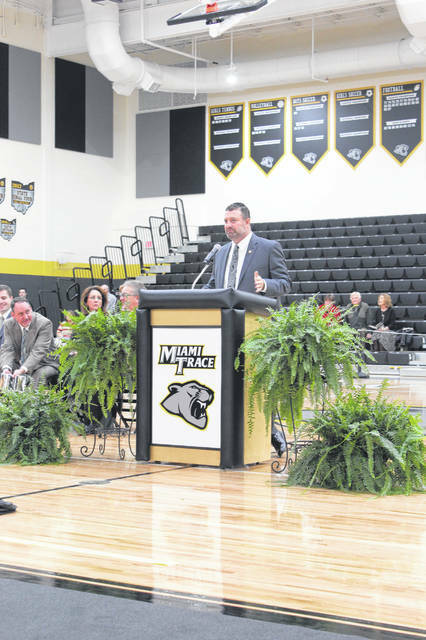 Miami Trace Superintendent David Lewis introduced the various guests attending the event, including project managers, board of education members, Miami Trace administrative members and other special guests. The Miami Trace High School cheerleaders and the Panther mascot danced to the Miami Trace Fight Song to conclude the event. 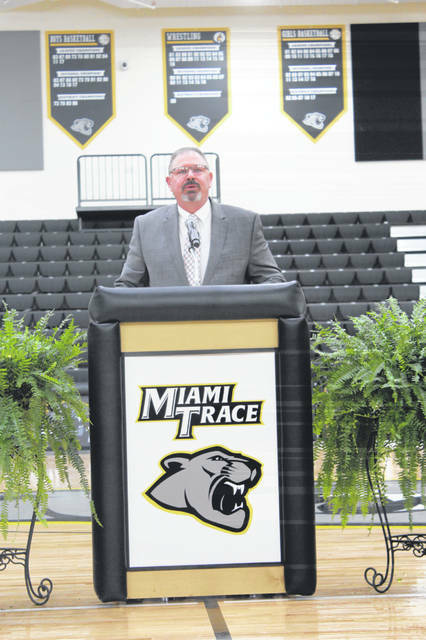 https://www.recordherald.com/wp-content/uploads/sites/27/2019/01/web1_IMG_1042.jpgMiami Trace Local Schools held a Dedication Ceremony on Sunday for the new Miami Trace High School with various guests in attendance. 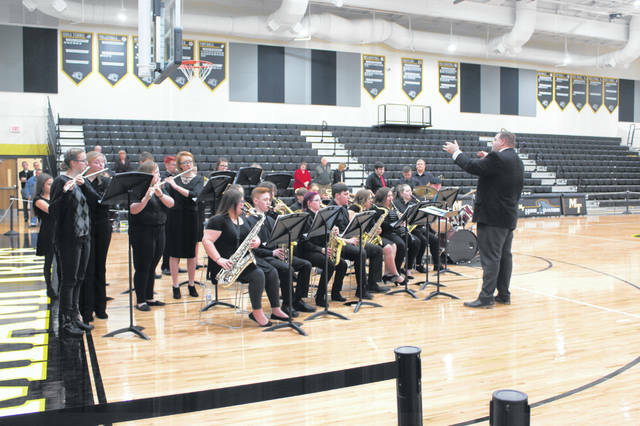 https://www.recordherald.com/wp-content/uploads/sites/27/2019/01/web1_IMG_1032.jpgThe Miami Trace Jazz Band performed the Alma Mater and the fight song during the ceremony. https://www.recordherald.com/wp-content/uploads/sites/27/2019/01/web1_IMG_1034.jpgMiami Trace Business Manager Bill Franke spoke about the project Sunday. Franke was the project manager on behalf of the district and worked closely with many groups involved in the creation of the school. https://www.recordherald.com/wp-content/uploads/sites/27/2019/01/web1_IMG_1002.jpgThe Miami Trace High School Soundsations also performed during the ceremony. https://www.recordherald.com/wp-content/uploads/sites/27/2019/01/web1_IMG_1021.jpgProject Manager, SHP Leading Design Josh Predovich (third from left), presented an etched plaque to the Miami Trace Board of Education and Miami Trace Superintendent David Lewis during the dedication Sunday. https://www.recordherald.com/wp-content/uploads/sites/27/2019/01/web1_IMG_1025.jpgProject manager with Ruscilli Construction Company Inc., (second from left) Bill Mullett, also presented a plaque to Miami Trace High School Principal Rob Enochs, Miami Trace Superintendent David Lewis, and the Miami Trace Board of Education on Sunday. https://www.recordherald.com/wp-content/uploads/sites/27/2019/01/web1_IMG_1008.jpgMiami Trace Superintendent David Lewis introduced the various guests attending the event, including project managers, board of education members, Miami Trace administrative members and other special guests. 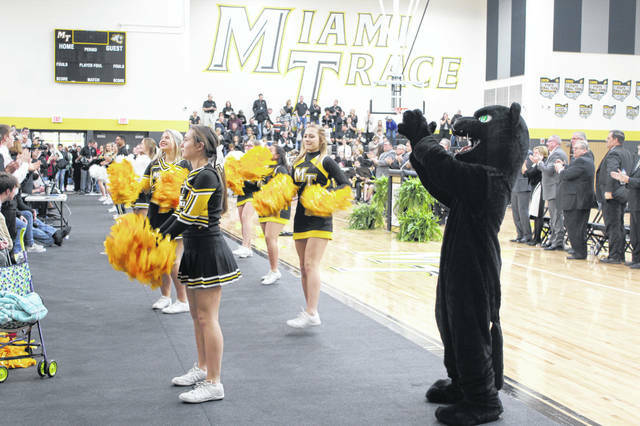 https://www.recordherald.com/wp-content/uploads/sites/27/2019/01/web1_IMG_1041.jpgThe Miami Trace High School cheerleaders and the Panther mascot danced to the Miami Trace Fight Song to conclude the event.